The download link was edited because it had some errors in Load some DLLs, now Project64k7E was fixed and reuploaded. 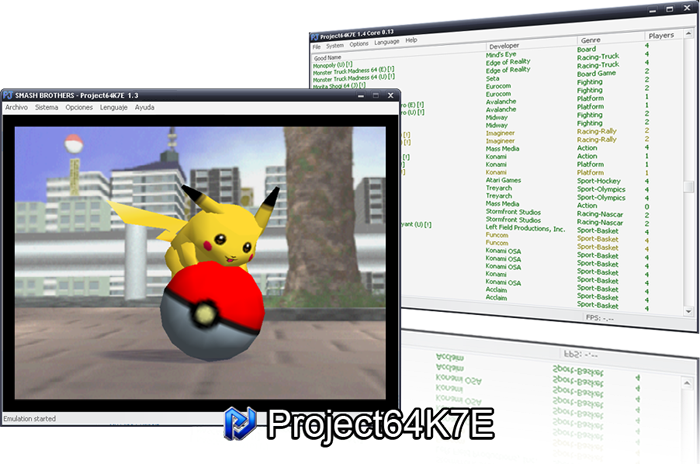 The download link of Project64K7E (1.3.1 Update - Nov 2012) and this are the same. Welcome, it's been a while since the last updated of the emulator, as there have been recent updates from some plugins, clients, RDB, etc... i also wanted to make my update of Project64K7E. 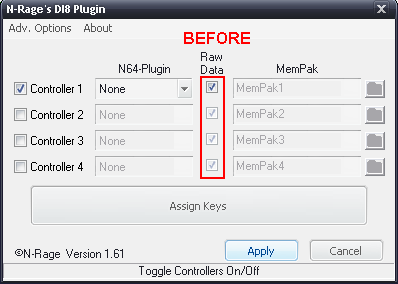 - Added NRage Input Plugin v2.3 Final. This fixes some important bugs from 2.2 Bet. Thanks to squall-Leonhart. - Added the n02 to release 18, Thanks to Ownasaurus. - Fixed some PSA cheats just to avoid Freeze, some PSA cheat were deleted because they had no solution. 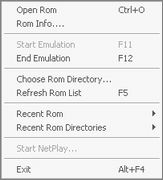 - It was discovered another cause of ds, Buffer Vsync, so if you want to play in Fullscreen, you can do, but by default, and by default it will have to be with Transfer Memory to prevent desynchronizations. - Added a .Reg file to enable cheats type "Have All", something that is important and useful for newbies. - Removed the error when trying to read Krecs, as the sole cause of this is when there is no such folder. - The Manifest was not added because some chipset and older computers have problems with D3D8 after a couple of games. - Fixed the Casual Image Freeze. - Link Homes of Files settings do not throw error and access to the pages correctly. - Disabled the option NRage RAWDATA of NRage's 2.3 to avoid problems in Netplay. - "About" now refers to the correct Thanks and Greetings. - Added to the RDX some symbols of "Good Verif.Dump" in GoodName. This would be a significant upgrade since errors were corrected on the remote control and the interaction between the "Controls Modifiers" and "Normal Controls", since they could not run both simultaneously, there were collisions which allowed the execution of one, but not the other. 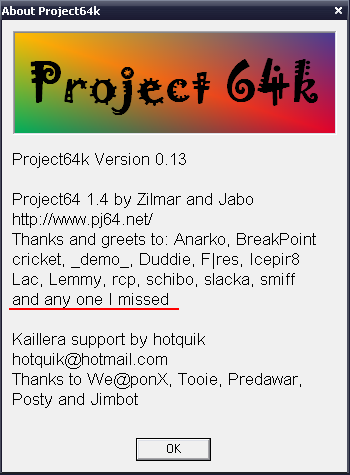 This was the reason why still 1.61 was maintained integrated in K7E. But because the new update, i removed the 1.61, since the 2.3 can fully replace its on his 100%, but I prefer that over time will dictate whether it deserves its place or not. Well, this is the last accomplishment of Owna, correcting all that was left pending in r17, like PM bugs or reproducing Krecs, these are things that was missing. These are the only cheats i found that had some problems, so i tried to correct it as well, but some very particular and specific chars were stuck anyway, so i saw no other choice than to eliminate faulty lines of code, leaving the PSA free Freeze. Now all the cheats of SSB should work correctly. Buffer Vsync is an option only for those who play in FullScreen, of course... I've seen many newbies who play this way... The Vsync Buffer stabilizes the FPS a little but out of sync in NetPlay at 2 minutes after starting, unlike Transfer of Memory, this does not happen. In the File Settings, clicking on Home Sites gave an error stating that the page does not exist, it was that the function does not support the format http://, so just deleting the http://, the Links of the developers of the Config Files are already operating. Added a .Reg file to Enable Cheats Type "Have All"
This is intended primarily for those who are new and unfamiliar Kaillera. Note that i ahve only integrated the "Have All" option of the games most played on Kaillera. The message only occurred when there was not a Record folder, when you create the folder, there is no message. The 1st time you see this message makes us believe that there really is an error when the only thing that tells you is that you need a folder, and the fun of it, when you get this error, the same emulator create the folder that tells you is missing. So i preferred delete the message. It may be look nice on some PCs, but the drawback is that it creates some Graphics problems in NetPlay. This problem is generated in some PCs, due to some old chipset (this even happened to me), the problem occurred after a game on Kaillera, and this was that the screen goes black and does not let you play more. Another bug that was caused by the Manifest was that the image was frozen when we went to another window in Windows... you could fix this with resizing the emulator window, but it is annoying to do this all the time. With this we get rid of the 2 errors already mentioned. As was said before, rawdata of NRage or Memory Pack of JaboInput are not supported for Kaillera, causing the controls or keyboards do not react to a Netplay game. The 2.3 is auto-activated in the 1 st use, so it's a problem for everyone. I decided to remove it, by puting in default auto-disable, so we will not have more problems in Kaillera or P2P. Little detail, many repeated names. Another tiny detail, I had forgotten to add some symbols of Good Verif.Dump in the previous version. - Added some Importantes Comentaries on CHT about NetPlay stabilities. - Added OoT Cheats multiplayer. - Added 3 more games Support. - Added NetPlay Input Plugin 0.2 (alternative P2P NetPlay). - Changed Audio Plugin by Azimers 0.30. - Added support for 3 more games. 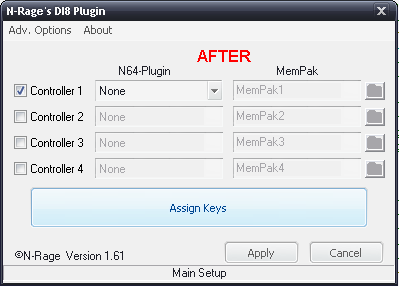 - Added NetPlay Input Plugin 0.13 (alternative P2P NetPlay). - Deleted Jabo D3D8 1.7, not stable build for 1.4. Hi Everyone, I decided a few days ago to work in the latest update of our K7E, below I will explain what changes were made. They're not many, but i hope you find it to your liking. Now you can play without displaying the error message when starting the emulator for the first time, this message also appeared when the emulator failed and we had to re-select the plugins, now is no longer necessary, because the emulator will not fail... at least for this reason. I added the Config Folder where you store all the files used by PJ64K7E (except for the dlls) the folder will have the RDX, RDB, RDN, CHT, LNG folders and the Cache, so the directory of our emulator is kept clear. Unlike the previous K7E, I eliminated all the unsupported SSB Cheats for the 1.4, to eliminate loading times, either when you enabled or disabled cheats. I wanted to leave it at 300, since the previous K7E had a major problem with the increase of support when we Clicked on "Mark All" or "Unmark All" if they were selected either of the 2, the emulator failed, but the CHT code were reduced. The 90% of the games played on Kaillera are from SSB, 9% would be Mario Kart 64, Mario Party (1, 2, 3), GoldenEye 007, Conker Bad Fur Day and 1% from other games. None of the above exceed 300 Cheats, so there is no reason (yet) to raise the support, moreover, if we do, we would leave the 2 buttons inoperatives (the buttons of "Mark All" and "Unmark All"), which would cause the crash we Emulator. All users of this plugin have ever had this problem and worse if they are new entrepreneurs in the world of Kaillera, because it is a headache for those who do not know how the fix. This is the Bug of the "RAW DATA", this bug precludes the player to move during the online games. Now is no longer a problem because I removed the "RAW DATA" option. It's a relief for many people. Even if it activates by another way, just by pressing "Apply" you can fix the problem. * "Show % CPU usage" was deactivated, because it precludes the player to read the messages (chat) in online mode in the lower section of the emulator. * 2 options were joined, because they opened the same window, I mean Contents and Index. F12 = Close the game. Ctrl + C = To load the cheats. Ctrl + T = To access the configuration. Ctrl + S = To save the game. Audio: Jabos Direct Sound 1.6 (to adjust the volume). Control: NRage 1.61 (Not added later versions because they have major bugs in the Controls Modifiers, impossible movement at certain times). Oops, someone from the Team of PJ64 forgot to mention some of his Team (Marked in Red), then i wanted to edit the "About" to not skip anyone who has worked as well as those who worked on the emulator, who gave support for Kaillera and finally Henryxs87 and i, who did the updates.